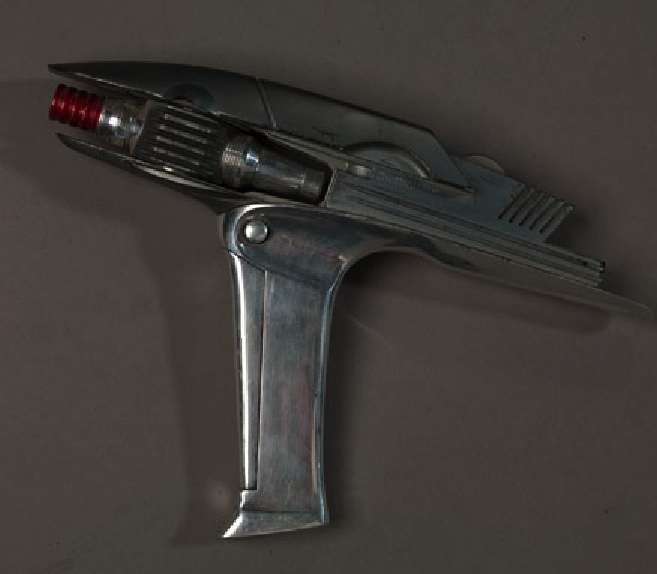 Standard Starfleet sidearm in the mid-23rd Century. Uses a dual-barrel firing system which rotates the required barrel forward depending on whether a Stun or Kill setting is required. Assuming that the increased traffic to my website isn't another DDoS attack and in reality reflects some added interest, then welcome! Sorry about the delay. 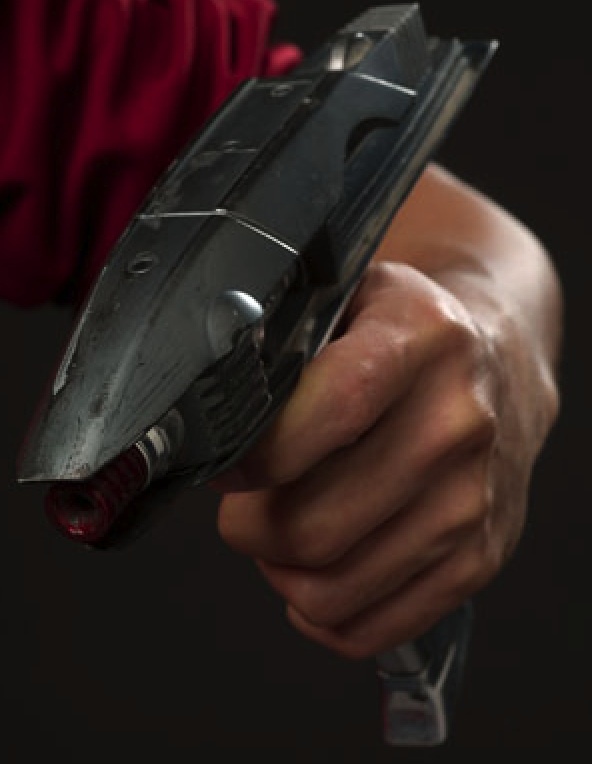 Yes, this is the new phaser from the new Star Trek film. I haven't watched it yet so I don't know a lot about it, but I gather from those who have that they're none the wiser. So, what can we say about it? Yes, it does have two barrels which spin around depending on what you want to do to the target, stun it or kill it. 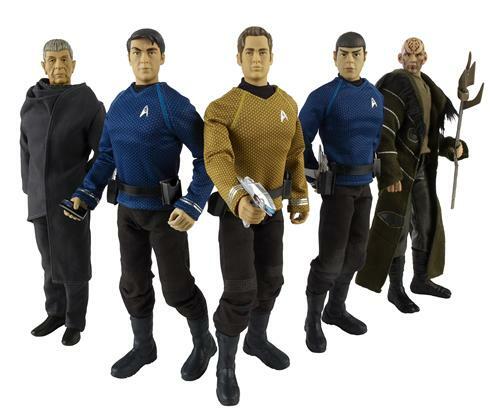 This was in fact the first information revealed on this prop - an EW article on 16 October 2008 said: "[Kirk and Spock] have infiltrated a Romulan warcraft only to see their mission explode into a raging phaser fight. 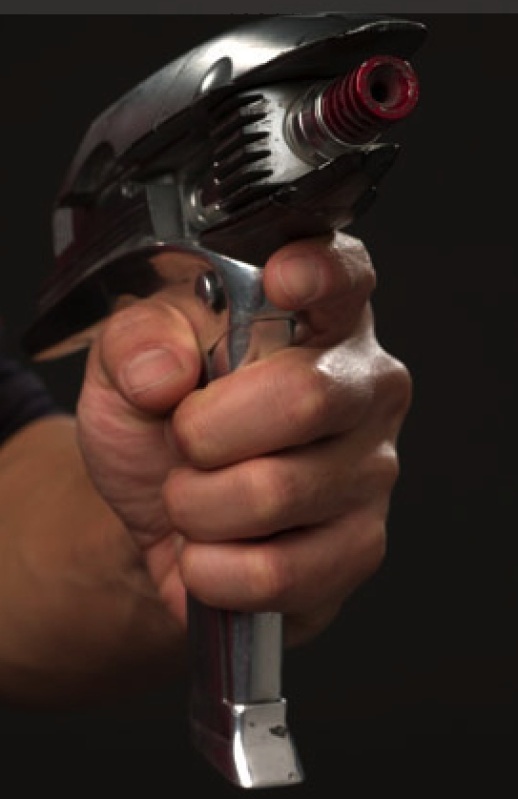 No longer are their signature Trek weapons boxy plastic toys, but sleek silver gizmos with spring-triggered barrels that revolve and glow in the transition from 'stun' to 'kill.' Problem is, every time Kirk raises his newfangled ray gun, the barrel revolves too early. Or too late. Or not at all. Giggles and unprintable curses fly. Someone lightens the mood with a quip: 'Most illogical, captain.'" The 'kill' barrel is coloured a helpful red to distinguish it. Health & Safety, 23rd-Century style! Now, I'm not sure how I feel about the idea. It seems to me that, given this film is (I think) set in an alternate 2250s, the alternating-barrel concept is meant to pay homage to the laser pistols from the two TOS pilot episodes "The Cage" and "Where No Man Has Gone Before." These weapons featured a triple-muzzle barrel which rotated around the axis of the line of fire depending on the setting required. 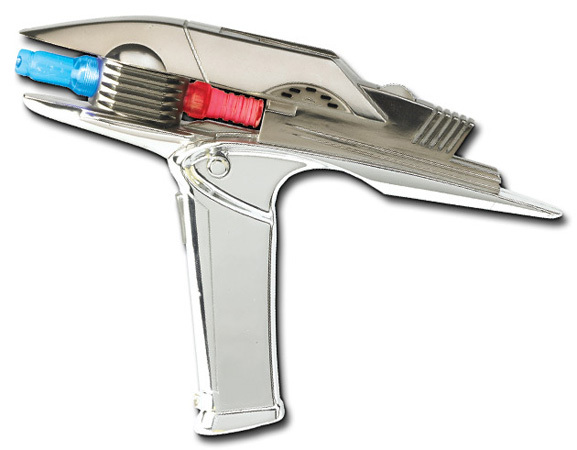 At the same time it has many design elements in common with the classic TOS Phaser which even those less familar with Trek might recognise. In conjunction with the film, Playmates have brought out a toy version which is quite a lot of fun (yes, I have one). It's quite accurate, although the 'real' prop is coloured a near-pewter rather than the chrome of the toy, which rubs off on your hands! The 'stun' barrel on the toy is blue, but metallic on the original. 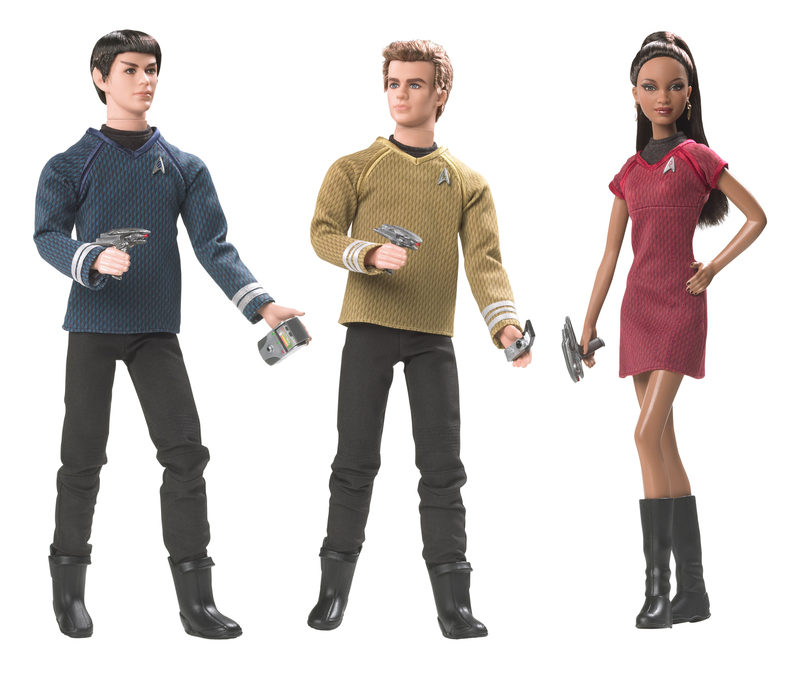 The action figures and, yes, Mattel's Barbie dolls also feature the phaser. If you own any of these latter toys and would like to comment, please write in (I guarantee your anonymity).